Arthur David Food With Service are celebrating their national triumph as Food Distribution Family Business of the Year Champions 2017. 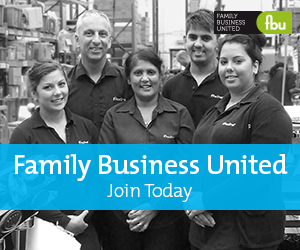 As Paul Andrews, Founder and Managing Director of Family Business United (‘FBU’) explains, "We were delighted to pull together such a vibrant bunch of family businesses for the 2017 awards, some that have succeeded for numerous generations and continue to thrive, and others that are relatively young but have great values at the heart of what they do. The food distribution sector was so well represented in the submissions that the judges felt compelled to include a Food Distribution category for the first time and the inaugural award went to Arthur David Food with Service." “Arthur David are a fantastic family firm dating back to 1962 who specialise in the procurement and delivery of fresh food products to the catering industry from their head office in the Chew Valley. Their name reflects the essence of what this family firm is all about, a mix of the traditional and the new and will serve as a great legacy that was started by their founder all those years ago." As Simon Bloom, Head of Simon Bloom Consultancy who were sponsors of this award adds, "This is a progressive family firm that has embraced changed, has a non-family MD who is essentially still 'part of the family' and the family values permeate all that the business, and the family, want to stand for. The business continues to grow and invest, building on their core values but without being afraid to move with the times. Arthur David Food With Service are a great ambassador not just for their sector, but for family firms across the UK too." Arthur David, Chairman on Arthur David Food With Service Ltd is delighted to have won this award, adding "I am very proud and humbled to have been nominated for an award; I have never won anything in my life so to have won this award makes me very happy." "We have been in business over 50 years. Our business and family lives have been one and the same; we have laughed together, argued together, cried at times together and enjoyed the trappings of our success together. I am proud to say that our family business now feeds my grandchildren and great-grandchildren and our family work ethic is living strong through third generation David's who make a difference to our business every day." "Mine, and my wife Diane's everlasting wish, is that our family values live long in the daily comings and goings of Arthur David Food With Service and the niceties of success continue to enrich the lives of not just the fourth and fifth generation Davids, but all those other staff who we call 'family' and as a team contribute to our success every day."